1) Welcome Gautam. 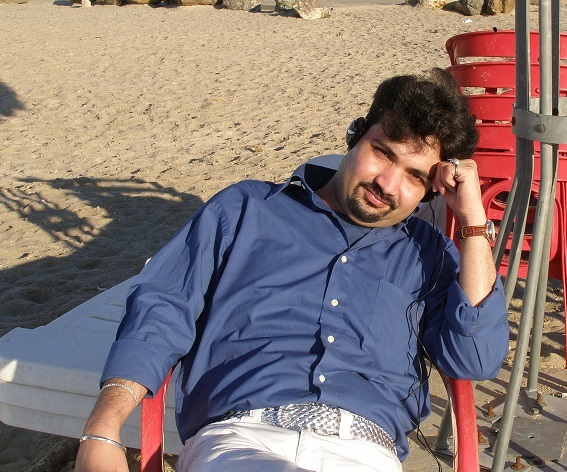 It’s a pleasure to have you on this platform of Indiacafe24.com. Our readers would surely want to have a sneak peak at your background. Kindly share a brief about you, your education and your family. Thank you. It is my pleasure as well to be talking to you today. We are basically from Kolkata but I was born and brought up in Assam, spent my childhood at different places across the North-East as my father used to get transferred every couple of years. After completing my post-graduation in management, we shifted to Delhi. I started off with working in the Insurance sector but eventually shifted to consulting. 2) Which Indian authors have inspired you the most? Well, there are many. R K Narayan to start with, his ‘Malgudi Days’ still remains firmly etched in my mind. Then Khuswant Singh. I remember reading his short story ‘The Mark of Vishnu’ which was a part of our English curriculum at school. Munshi Premchand and Mahadevi Verma, though the later is more a poet. I love the fact that she loved pets and often wrote stories about them; not many though. I can never forget Premchand’s ‘Nirmala’. I love reading Jhumpa Lahiri, Vikram Seth and Amitav Ghose, though I picked their books a little late. Prafulla Roy is another writer I am fond of, I have read all his books. 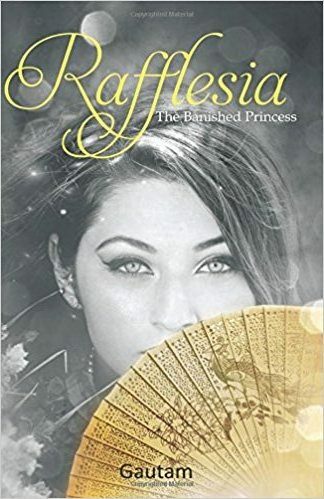 3) Novels and especially the genre of romance is ruling the market, in such market demands you penned ” Rafflesia- The Banished Princess “, which is quite a different subject… Was it not a risky attempt? I agree. To tell you frankly, I had no intention of getting published in the first place. I can’t even remember writing a poem ever, forget a full length novel. I started writing just as a past time. When I started, I had no idea of what to write about, I just scribbled stuff here and there. Have lost count of the number of times the story and the characters changed during the seven years (well almost) Rafflesia was in writing. And I wrote it only for myself until once when I accidently mentioned it to a journalist friend of mine who then wanted to see the manuscript. She eventually convinced me to try publishing. As you have pointed out, the book is ‘off the hook’, and I had almost started writing a romance when faced with rejections, but the belief that there would be an audience for Rafflesia, stayed strong. So I decided to stay put. The journalist friend I mentioned provided moral support. For the risky attempt part of your question, all I can say is I did not have any ambitions like becoming popular or getting sold, the subject didn’t seem to matter much. I was probably like an Ostrich – buried my head in the sand and just believed what I wanted to believe. The best thing (and one I cannot always tell openly) is, I enjoyed writing Rafflesia. Very immensely. 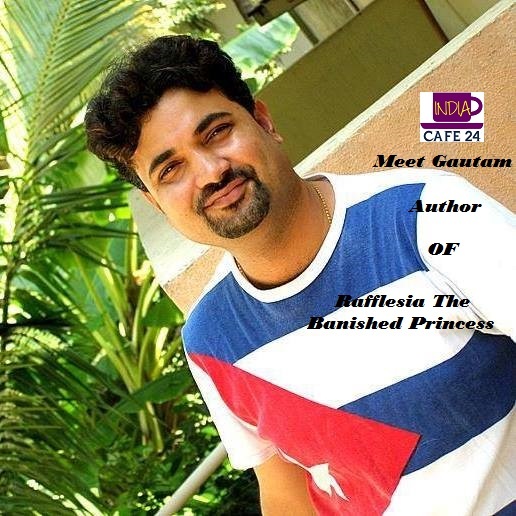 For those few years when I wrote, I existed in a parallel world with all the characters of Rafflesia in constant presence – Sujata, Misha, Aabir, Trina, Appu, Rahul, Nanujaan, Mrinalini, Vijayan. I was living with them. That is my biggest takeaway from the book. Looking back now, I think I miss writing it, those moments’ will never come back. Somewhere, there is also a lingering feeling that Rafflesia hasn’t reached its true audience yet, and I cannot do anything much about it. The book has to make that journey on its own. 4) What do you think about romantic novels and their popularity in market? Which genre is your favorite and why? Romance as a genre gets a lot attention. It attracts people and it is a universal truth. I have had my fair share of romance reads. The most popular cricketer at our school was a stickler for Mills and Boons. Can you believe that? It was his best kept secret until someone spilled the beans. No doubt, romance novels still continue to be so popular. I read across genres – don’t have any favorite. So it was all Charles Dickens, Jane Austen, Robin Cook, Sydney Sheldon, Harold Robbins, Robert Ludlum and Jackie Collins combined during my growing years – they are my favorites. I don’t get enough time to read nowadays, try to read a few pages every night on my kindle before going to sleep. 5) What protocol you have followed when you chalked out the plot of the story ‘Rafflesia- The Banished Princess”. Do you have any connection with the story in real life? I am not a disciplined person. There were no protocols for writing Rafflesia. I grew up as a lonely child. The presence of relatives in my life was very limited, or I can say practically nil. I always wished to be surrounded by a lot of people like my friends – many stayed in joint families. Some still do, and they enjoy the comfort of this emotional cushion which I never had. Their people treated me like one of their own, but I still missed having mine. I must have seen my own grand-parents not more than twice or thrice in my life. My parents were pretty progressive and liberal for their times, they were into their own stuff. As a child, I spent a whole lot of time staring at fishes in fish tanks. I suppose these realizations must have played some role in the background – so you have characters like Aga Ali Sheikh and Mrinalini in the book who filled the role of the grandparents I always wanted to have. The parents, Aabir and Trina – emotionally indulgent, I enjoyed visualizing and writing about them. The other characters filled in the other roles. Rahul is probably a combination of all my friends put together – not that they are bad, they are all very loving and caring people but Rahul is different – conceptualizing him was the most difficult, a character apparently endowed with all the virtues of how you define a modern man – smart, suave, outgoing, social and confident, yet very different once you get to see his other side. I wish for everybody to have a friend like Rahul in their lives. 6) What sort of response you are getting for your book? Most have given it a thumbs up. Some have bent their thumbs a little! To all readers who have given their time and spared their thoughts for this book – I take a bow. I have great respect for them. Time is precious in today’s world and I want to thank each and every one (including you) who have read the book – a rather amateurish debut. The good words that have come my way is really overwhelming, I did not expect so much. Yes, the reactions have been diverse and different people have interpreted the book differently. It all comes from one’s own life experiences I guess. Another thing which surprised me was how people perceived the character of Appu, one among the several protagonists. While writing, I didn’t mean him to be a ‘closed’ character, he remains caged in his emotions, he is shy, alright, but not someone who is kind of ‘off’ – but what came across in the book probably was very different. I think people like Rahul and Appu are everywhere, it’s just that we don’t get to see their real selves (unlike in the book). What you see is not what you get. There is a story behind every face, but getting to that story is a tough journey. Once you are there, it is all the same – the emotions, insecurities, longings, dreams and desires – in some way or the other. We live in a largely pretentious society which is sad. Finally, Rafflesia is not just about a single life or a character, it is about many lives – Appu is just the connecting dot, this is something I wanted to say. 7) Who is the one who for the first time noticed the spark in you to become an author? I seriously don’t know. No one noticed (including myself:)). My friends were shocked when they came to know about Rafflesia. They could not associate me with the book at all, saying it must have been ghost written by someone else. They still cannot relate me with the book. 8) The conflict between the publishers and authors is very common. Have you faced such problem while finding publisher for your books? The business of books, is a well, a business. At the end of the day, the balance sheet prevails, and that is exactly how it should be. So conflicts arise. One editor said Rafflesia was midlist. I thought he was paying me a compliment until I googled ‘midlist’. Publishing Rafflesia took a long time – there were a few publishers who wanted to tweak the story. Some wanted the characters to change. A few had advised me against publishing it as a debut. I had written two alternate endings even, but at the end decided to retain the original. 9) When you first realized that you can too be an author? I have no idea. I don’t consider myself as an author yet, just a learner. There used to be many once upon a time. Just a few right now, reading included. I care for pets, I just love them and can’t seem to do without pups and kittens – don’t have any now though. Busy city lives allow little time and space for pets. My job makes me travel places, I love that. Remain busy with the humdrums of daily life otherwise. 11) What are your future plans ? I want to continue writing. I realized I enjoyed it too much to give up while writing Rafflesia. 12) What next in pipeline and of what genre? A thriller! Rafflesia has left many people heavy chested 🙂 I want to try different genres, even attempt a satire and some non-fiction stuff. At some point of time, I’ll write a story about this beautiful singer with a melodious voice named Aayaat– about her life and times. Her story keeps haunting me a lot. Another, about a woman called Shorobani, her obsession with the kitchen and its consequences. Then there is a fictional cricketer I want to write about. But all these have to wait until I return to familiar turfs. Until such times, I want to explore. 13) What do you like and dislike in present day young authors? How different are the traditional authors and the young generation authors? I don’t dislike anything about any author or anyone for that matter. Authors are all thinking individuals and every book they write is a piece of gem. They show us different dimensions and shades of life – real/fictional. They play with our imaginations. They make us laugh and cry. If you see, the essential set of variables in all stories remain the same, who is able to manipulate them effectively, how, and to what extent is what sets one author apart from the other. And this is something probably dictated by changing times and tastes. I have observed many authors writing something different at the initial stages of their writing career and then moving on to something different as they progress. Thoughts and opinions change all the time – whether we admit it or not. That counts, perhaps.